JOHANNESBURG — West African giants Ghana and Ivory Coast were given tough tasks when the African qualifying draw for the 2014 World Cup was made in Rio de Janeiro Saturday. Ghana, quarter-final losers on penalties to Uruguay in the 2010 tournament hosted by South Africa, will face formidable Zambia and Sudan plus minnows Lesotho or Burundi in one of 10 second-round groups. Ivory Coast, seeking a third consecutive World Cup appearance when Brazil stages the 2014 finals, drew the second seed no one wanted — Morocco — in a mini-league completed by Gambia and Chad or Tanzania. The other four African qualifiers for the 2010 finals, the first played on the continent, will sleep more peacefully after a draw made by former Brazilian World Cup winner Cafu and rising star Neymar. 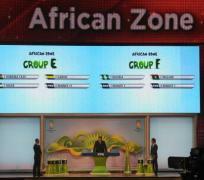 South Africa got neighbours Botswana, Central African Republic and Somalia or Ethiopia and it would be a shock if Bafana Bafana (The Boys) failed to make the 10-nation final phase of the elimination process. Nigeria have a habit of making simple tasks difficult, but the Super Eagles can offer no complaints after being put in the same pool as Malawi, Seychelles or Kenya and Djibouti or Namibia. Algeria will tread warily against Mali and Benin — two sides playing poorly at present — in a pool also including Eritrea or Rwanda, but appear good enough to finish in top spot. Cameroon, although not currently displaying the form expected of a country holding the African record for World Cup appearances with six, are up against Libya, Guinea Bissau or Togo and Swaziland or the Democratic Republic of Congo. Although the Congolese are the lowest seeds in this section, they are capable of posing the greatest threat having forced an away draw with the Indomitable Lions this year in an Africa Cup of Nations qualifier. Egypt, African champions seven times but only twice World Cup qualifiers, will fear Guinea most in a mini-league completed by Zimbabwe and the Comoros Islands or Mozambique. Senegal, who reached the World Cup quarter-finals nine years ago, and Uganda are among the most improved teams on the continent and must compete with Angola and Mauritius or Liberia for a third-round slot. There does not appear to be much between Burkina Faso, ranked fourth on the continent by FIFA, Gabon and Niger in a section that Sao Tome e Principe or Congo will complete. Tunisia are a side on the rise under new coach Sami Trabelsi and it is hard to imagine them not going through after drawing Cape Verde Islands, Sierra Leone and Equatorial Guinea or Madagascar. The two-leg first round matches will be staged on November 11 and 15, the 10 second round groups kick off on June 1 2012 and the five third-round ties that will decide who flies to Rio are scheduled for October and November 2013.